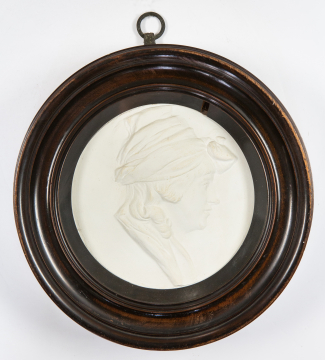 Medallion portrait of the sculptor's wife, Anne ('Nancy') Flaxman (née Denman), plaster (in glazed frame), pair with SC27. You are here: CollectionsOnline / Medallion portrait of the sculptor's wife, Anne ('Nancy') Flaxman (née Denman), plaster (in glazed frame), pair with SC27. Soane owned another version of this medallion portrait, see Soane A19.